IAC posts "Influenza Vaccine Products for the 2017–2018 Influenza Season"
IAC updates "Screening Checklist for Contraindications to Inactivated Injectable Influenza Vaccination"
IAC updates "Standing Orders for Administering Influenza Vaccine to Adults" and "Standing Orders for Administering Influenza Vaccine to Children and Adolescents"
IAC updates "Guide for Determining the Number of Doses of Influenza Vaccine to Give to Children Age 6 Months through 8 Years during the 2017–2018 Influenza Season"
IAC posts revised "Influenza Vaccination of People with a History of Egg Allergy"
IAC updates "How to Administer Intramuscular, Intradermal, and Intranasal Influenza Vaccines"
On September 6, the San Diego County Board of Supervisors ratified a local health emergency declaration to try to stem the county's hepatitis A outbreak. A section of a related article from the County of San Diego Communications Office is reprinted below. Since the outbreak was identified in early March, 15 people have died, all of whom had underlying medical conditions. Additionally, 279 of the 398 reported cases have been hospitalized. Approximately 65 percent of the cases have been among people who are homeless, use illicit drugs, or a combination of those two factors. The County has implemented a three-part strategy to combat the outbreak that includes immunization, sanitation, and education efforts. A recently published Research Letter by P.L. Delamater et al. in JAMA found that medical exemptions to immunization in California had risen after the elimination of personal belief exemptions. The first paragraph of the letter titled Change in Medical Exemptions From Immunization in California After Elimination of Personal Belief Exemptions is reprinted below. California Senate bill (SB) 277 eliminated the personal belief exemption (PBE) provision from the state’s school-entry vaccine mandates prior to the 2016–2017 school year. Previously, vaccine-hesitant parents could acquire a PBE for their child based on philosophical or religious beliefs. Now, the only pathway for an unvaccinated kindergartener to enter a public or private school in California is with a medical exemption (ME), which requires a written statement from a licensed physician describing the medical reasons that immunization is unsafe. Previously, MEs were only granted to children with a contraindication to vaccination; however, SB 277 gave physicians broader discretion to grant MEs for reasons other than a contraindication, including family medical history. A related article in Medical Press provides a summary of the findings. Finally, Dr. Paul A. Offit, MD, director of the Vaccine Education Center (VEC) at Children's Hospital of Philadelphia, contributed a column on this topic to The Daily Beast titled Who’s Cheating California’s Tough New Vaccine System? The concluding paragraphs are reprinted below. Typically, about 0.5 percent of children require a medical exemption. Indeed, the 2,850 medical exemptions requested represent 0.5 percent of California’s kindergarten population. But according to the Los Angeles Times, in 58 schools, more than 10 percent of kindergarteners chose medical exemptions; at seven schools, more than 20 percent did. Many of these exemptions occurred in Los Angeles, San Diego, and Orange counties: the same counties that produced the 2014–2015 measles epidemic. The unusual resource? After SB277 passed, anti-vaccine websites appeared across the state coaching parents on how to request medical exemptions; many of these websites included a list of doctors sympathetic to parents who felt they were being unfairly coerced into vaccinating their children—doctors who, by requiring an office visit, were essentially selling a medical exemption. “It would be very unfortunate if there were physicians who’ve shirked their professionalism, and basically are trying to monetize their professional license by putting children at risk and betraying public health,” said Richard Pan (D-Sacramento), a physician who co-authored SB277. Given this most recent development, it would take a counsel of the gods to determine which aspect of the anti-vaccine movement is most upsetting: parents choosing to put their children in harm’s way unnecessarily; state governments, through philosophical and religious exemptions, allowing them to do it; or doctors, in some misguided sympathy for freedom of choice, writing bogus medical exemptions for a price. At the very least, public health officials and licensing boards in California need to take a closer look at the reasons behind the dramatic increase in medical exemptions. And if they find that these exemptions have no basis in fact, doctors should be held accountable for their fraudulent behavior. On September 1, AAP News published Shoulder Injury Related to Vaccine Administration Reported More Frequently by H. Cody Meissner, MD, FAAP. Three paragraphs are reprinted below. Shoulder injury related to vaccine administration (SIRVA) is believed to be caused by an immune response following inadvertent, direct injection of a vaccine into the deltoid bursa or joint space. Access the complete article in PDF format for more information, including guidance on avoiding such injuries with proper vaccine administration, including details on anatomic area, route, and needle length. The anti-vaccine lobby has really . . . scaled up both the frequency by which they’ve been going after me and the tenor of the comments . . . It is very hurtful, but I try not to respond to it directly; I try to stick to the scientific evidence . . . I do have a lot of support in the science community. To fight back against this barrage of attacks against him, his daughter, and vaccination, Dr. Hotez is writing a book, Vaccines Did Not Cause Rachel’s Autism. The National Adult and Influenza Immunization Summit (NAIIS) has developed tools to assist satellite, temporary, and off-site vaccination clinics in implementing best practices. These clinics, functioning in non-traditional settings, face unique challenges. Information about these tools and their purpose can be found on the new Tools to Assist Satellite, Temporary, and Off-Site Vaccination Clinics web section of the NAIIS website. In particular, NAIIS is urging partners holding these clinics to take the pledge. The pledge is for organizations that conduct satellite, temporary, or off-site vaccination clinics to sign annually affirming that they will adhere to best practices, including using the "Checklist of Best Practices for Vaccination Clinics Held at Satellite, Temporary, or Off-Site Locations." Organizations that sign the pledge will be recognized on the NAIIS website for their commitment to provide safe and effective vaccine clinics. Companies seeking to hire an organization to conduct a vaccination clinic can check to see if that organization has signed the pledge and is recognized on the NAIIS website. If your organization has signed the pledge, please send an email to vaxclinicpledge@izsummitpartners.org with the subject “Vaccine Clinic Pledge Form.” In the message area, include your organization's name and an email address for an organization contact. Please be sure to attach a copy of your signed pledge so that we can properly recognize you! Read more about the launch of these new tools and their purpose in the NAIIS web section titled Tools to Assist Satellite, Temporary, and Off-Site Vaccination Clinics. There are now 636 organizations enrolled in IAC's Influenza Vaccination Honor Roll. The honor roll recognizes hospitals, medical practices, professional organizations, health departments, and government entities that have taken a stand for patient safety by implementing mandatory influenza vaccination policies for healthcare personnel. Since August 16, when IAC Express last reported on the Influenza Vaccination Honor Roll, three additional healthcare organizations have been enrolled. Everyone is invited to join the National Foundation for Infectious Diseases (NFID) and the Washington Nationals for the 6th Annual Flu Awareness Night in Washington, DC this Friday, September 15. The Nationals will take on the Los Angeles Dodgers, and $5 from each ticket sold will be donated to NFID to help support the prevention and treatment of infectious diseases, including influenza. Access more information and/or purchase tickets. IAC has posted an updated version of its Influenza Vaccine Products for the 2017–2018 Influenza Season. Changes were made to incorporate all available influenza vaccine products for the 2017–2018 influenza vaccination season. IAC recently revised Screening Checklist for Contraindications to Inactivated Injectable Influenza Vaccination to delete a duplicative statement about oculorespiratory syndrome and to update a reference. Both of the changes are on the second page, which is a reference guide for healthcare providers. IAC recently revised both its sample standing orders for administering influenza vaccine. IAC recently posted the updated version of Guide for Determining the Number of Doses of Influenza Vaccine to Give to Children Age 6 Months Through 8 Years During the 2017–2018 Influenza Season. The title and ACIP reference were changed to be current with the 2017–2018 influenza season. IAC recently revised Influenza Vaccination of People with a History of Egg Allergy for the 2017–2018 season by incorporating the quadrivalent recombinant vaccine (RIV4) and updating the references. IAC has posted an updated version of its resource for healthcare professionals, How to Administer Intramuscular, Intradermal, and Intranasal Influenza Vaccines. Changes were made to add newer inactivated influenza vaccine (IIV) products to the intramuscular (IM) section (i.e., ccIIV, aIIV) and to incorporate a slight change in needle length for administering IM injections to children and adolescents. The American Academy of Pediatrics (AAP) published a policy statement online titled Recommendations for Prevention and Control of Influenza in Children, 2017–2018. The recommendations are also available in PDF format, and will be published in the October issue of Pediatrics. AAP recommends annual seasonal influenza immunization for everyone 6 months and older, including children and adolescents. The World Health Organization (WHO) published Cholera, 2016 in the September 8 issue of its Weekly Epidemiological Record. The first paragraph is reprinted below. Cholera remains a significant public health problem in many parts of the world. In 2016, 38 countries reported a total of 132,121 cases including 2,420 deaths, resulting in an overall case fatality rate (CFR) of 1.8%. Although this represents a 23% decrease in the number of cases reported compared with 2015 (172,454 cases), the decline is, nonetheless, accompanied by a more than doubling of the CFR (0.8% in 2015). Cholera was reported from countries in all regions: 17 countries in Africa, 12 in Asia, 4 in Europe, 4 in the Americas, and 1 in Oceania. Five countries, the Democratic Republic of the Congo (DRC), Haiti, Somalia, the United Republic of Tanzania Yemen, together accounted for 80% of all cases. Of cases reported globally, 54% were from Africa, 13% from Asia, and 32% from Hispaniola. Imported cases were reported from 9 countries. On September 1, the Bulletin of the World Health Organization published Estimated economic impact of vaccinations in 73 low- and middle-income countries, 2001–2020. Three sections of the abstract are reprinted below. To estimate the economic impact likely to be achieved by efforts to vaccinate against 10 vaccine-preventable diseases between 2001 and 2020 in 73 low- and middle-income countries largely supported by Gavi, the Vaccine Alliance. We estimated that, in the 73 countries, vaccinations given between 2001 and 2020 will avert over 20 million deaths and save US$ 350 billion in cost of illness. The deaths and disability prevented by vaccinations given during the two decades will result in estimated lifelong productivity gains totalling US$ 330 billion and US$ 9 billion, respectively. Over the lifetimes of the vaccinated cohorts, the same vaccinations will save an estimated US$ 5 billion in treatment costs. The broader economic and social value of these vaccinations is estimated at US$ 820 billion. By preventing significant costs and potentially increasing economic productivity among some of the world’s poorest countries, the impact of immunization goes well beyond health. Access the complete article in PDF format: Estimated economic impact of vaccinations in 73 low- and middle-income countries, 2001–2020. 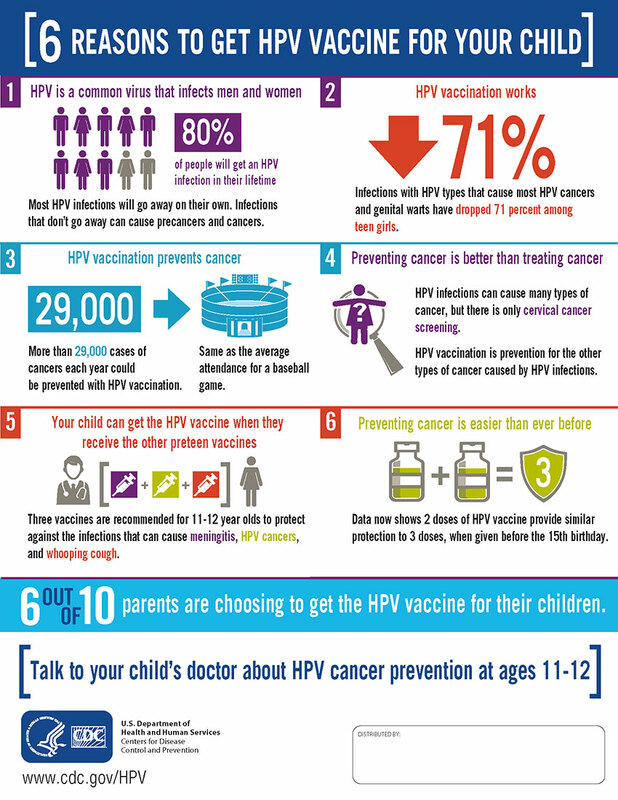 CDC has developed an infographic that healthcare professionals can share on social media to help parents understand the importance of HPV vaccination for their adolescent children. Click on the image below to go to the appropriate CDC web page. The image can also be printed out and used as a poster or flyer. The text can also be adapted for use in practice newsletters, letters to the editor, Facebook posts, and more. Three vaccines are recommended for 11–12 year olds to protect against the infections that can cause meningitis, HPV cancers, and whooping cough. Data now shows 2 doses of HPV vaccine provide similar protection to 3 doses, when given before the 15th birthday. 6 OUT OF 10 parents are choosing to get the HPV vaccine for their children. Talk to your child’s doctor about HPV cancer prevention at ages 11–12. “Dear Colleague” letter from AAFP, AAP, ACOG, ACP, CDC, and IAC: Give a strong recommendation for HPV vaccine to increase uptake! Watch "Someone You Love: the HPV Epidemic," a documentary that presents the struggles and triumphs of five women whose lives were changed forever by this deadly virus. Access the trailer on YouTube. Physicians, nurses, and pharmacists can earn free continuing credit for viewing the complete film. Others can view the film for free, courtesy of PKIDs (not for continuing education credit). The Hepatitis B Foundation and the ShotByShot project have jointly released a video titled Jason's Story: #justB Aware. Jason learned he was infected with the hepatitis B virus (HBV) as well as HIV after a history of drug addiction. He struggled to find any hepatitis B specialists in his home town and became depressed, but finally located a caring and knowledgeable doctor who, along with his husband, gave him hope and improved health. This video is part of the storytelling campaign: #justB: Real People Sharing their Stories of Hepatitis B. The volunteers sharing their stories do so to put a human face on this serious disease, decrease stigma and discrimination, and promote the importance of testing and treatment for hepatitis B.
CDC recently released the August issue of its monthly newsletter Immunization Works and posted it on the website of the National Center for Immunization and Respiratory Diseases (NCIRD). The newsletter offers the immunization community information about current topics. The information is in the public domain and can be reproduced and circulated widely. On September 7, The New England Journal of Medicine (NEJM) published Effectiveness of a Third Dose of MMR Vaccine for Mumps Outbreak Control (C.V. Cardemil et al. ), which showed that a third dose of MMR helped protected college students against a mumps outbreak. Three sections of the abstract are reprinted below. The effect of a third dose of the measles–mumps–rubella (MMR) vaccine in stemming a mumps outbreak is unknown. During an outbreak among vaccinated students at the University of Iowa, health officials implemented a widespread MMR vaccine campaign. We evaluated the effectiveness of a third dose for outbreak control and assessed for waning immunity. Before the outbreak, 98.1% of the students had received at least two doses of MMR vaccine. During the outbreak, 4,783 received a third dose. The attack rate was lower among the students who had received three doses than among those who had received two doses (6.7 vs. 14.5 cases per 1000 population, P<0.001). Students had more than nine times the risk of mumps if they had received the second MMR dose 13 years or more before the outbreak. At 28 days after vaccination, receipt of the third vaccine dose was associated with a 78.1% lower risk of mumps than receipt of a second dose (adjusted hazard ratio, 0.22; 95% confidence interval, 0.12 to 0.39). The vaccine effectiveness of two doses versus no doses was lower among students with more distant receipt of the second vaccine dose. Students who had received a third dose of MMR vaccine had a lower risk of mumps than did those who had received two doses, after adjustment for the number of years since the second dose. Students who had received a second dose of MMR vaccine 13 years or more before the outbreak had an increased risk of mumps. These findings suggest that the campaign to administer a third dose of MMR vaccine improved mumps outbreak control and that waning immunity probably contributed to propagation of the outbreak. In January 2017, a survey underwritten by C.S. Mott Children’s Hospital asked a national sample of parents about getting vaccines for their age 13–17 teen children, and found that many parents likely overestimate their teens’ vaccination status. The Mott Poll Report was published on July 2017, and the "Highlights" section and selections from its "Implications" section are reprinted below. Read the complete Mott Poll Report: Parents Not Keeping Up with Teen Vaccines. CDC published Update: Increase in Human Infections with Novel Avian Influenza A(H7N9) Viruses During the Fifth Epidemic and Pandemic Preparedness—China, October 1, 2016–August 18, 2017 in the September 8 issue of MMWR (pages 928–32). A summary made available to the press is reprinted below. The fifth annual epidemic of Asian Lineage Avian Influenza A(H7N9) Viruses in China is marked by extensive geographic spread in poultry and in humans. The number of human infections reported in the fifth epidemic is almost as many as were reported during the previous four epidemics combined. The increased number of human infections appears to be associated with wider geographic spread and higher prevalence of Asian H7N9 viruses among poultry rather than any increased incidence of poultry-to-human or human-to-human spread. Human infections with Asian H7N9 viruses from poultry are rare, and no efficient or sustained human-to-human transmission has been detected. Among all influenza viruses assessed using CDC’s Influenza Risk Assessment Tool, the Asian H7N9 virus is ranked as the influenza virus with the highest potential pandemic risk. Continued vigilance is important to identify changes in the virus that have epidemiologic implications, such as increased transmission from poultry to humans or transmission between humans. The National Foundation for Infectious Diseases (NFID) will present three new webinars as listed below. CME and CNE credit is available for completing any of these activities. The Indiana Immunization Coalition (IIC) will host a meeting on October 5 about the importance of incorporating standing orders for vaccines in clinical practice settings. The speakers, William Atkinson, MD, MPH, and Litjen Tan, MS, PhD, both from the Immunization Action Coalition, are nationally recognized experts on this topic. CME and CNE credits are being offered to participants. Access more information about IIC's October 5 "Take a Stand" conference. My adult patient is traveling to Nigeria in three days. She is already immune to hepatitis A, but we want to provide protection for hepatitis B. She received Twinrix two weeks ago and then a dose of single-component hepatitis B vaccine one week ago. How can we best provide protection in this circumstance? Even though ACIP does not recommend an accelerated hepatitis B vaccine schedule in routine circumstances, a 4-dose series at 0, 7, 14 days, and 6 months is acceptable (see https://www.cdc.gov/mmwr/PDF/rr/rr5516.pdf, page 27). Although this schedule deviates from the routine recommendation, travel is imminent. Give a dose of hepatitis B vaccine now which will complete 3 of the 4-dose accelerated schedule. She will need a fourth and final dose 6 months after the first dose in the accelerated schedule. #Vaccines by the Numbers: CDC provides statistics that make the point that vaccines are a great public health benefit. For all U.S. children born between 1994 and 2016, vaccines will prevent 381 million illnesses, 24.5 million hospitalizations, and 855,000 deaths in these children's lifetimes.